Identifying the largest historic districts in New England was no easy task, as the region has so many collections of historic buildings, landscapes, cemeteries, lighthouses and bridges. It was especially tough to decide on the largest historic district in Rhode Island, as Providence and Newport both have extensive collections of contiguous historic buildings. We opted for Ocean Drive in Newport, as it contains 1,509 acres. Our readers may think differently about our selections. If you’d like to make a case for the largest historic district in a New England state, please include it in the comments section below. The Wethersfield Historic District in Conn., tucked between Hartford and Rocky Hill, covers 1,300 acres, and it contains 1,200 structures with about 100 dating back to colonial times. Wethersfield was the first settlement in Connecticut, founded in 1634 by an offshoot of the Massachusetts Bay Colony. 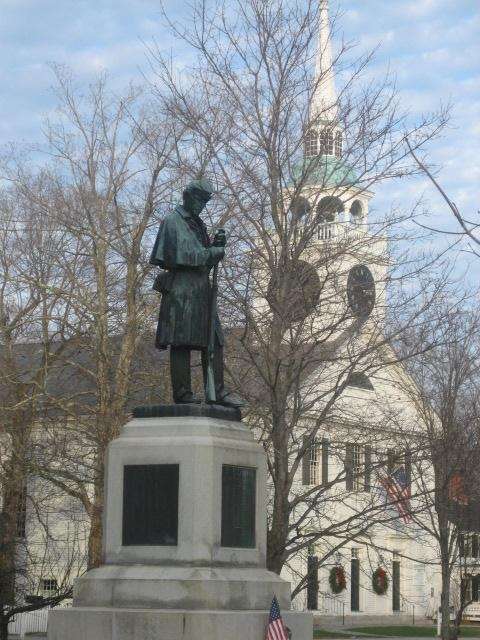 The town itself boasts a rich history as it evolved from a struggling early colonial outpost, to a transportation hub, to a major contributor of soldiers to the American Revolution and finally to its prominence as home to the Wethersfield onion. Work on officially protecting the historic district began in 1962, when it was designated as a historic district, and in 1970 it was placed on the National Register of Historic Places. The district is home to many residents and businesses. 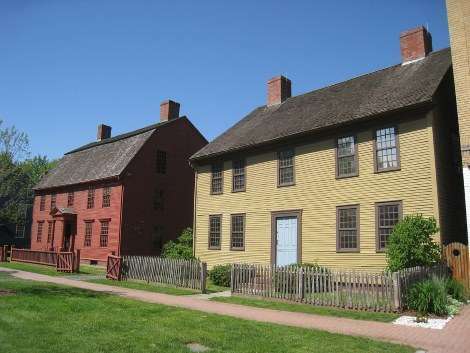 Most famously it also contains the Silas Deane House (1766), the Joseph Webb House (1752); and the Isaac Stevens house (1790). These are all open to the public via the Webb-Deane-Stevens Museum, as is the Town Green, which stretches nearly a half mile. The Green is surrounded by Colonial and Federal style houses, many originally built for sea captains. Many of these simple homes retain their original character and are excellent examples of the carpentry used by skilled builders whose primary trade was shipbuilding. Maine, the largest state in New England, is naturally home to several of its largest historic districts. The Schoodic Historic District in Acadia National Park takes in more than 1,000 acres of raw natural seascapes. The Castine Historic District, with its rich colonial history, takes up about 1,800 acres on the southern end of the Bagaduce Peninsula. Meanwhile, the Sabbath Lake Shaker Village, near Poland and New Gloucester, sits on somewhere between 1,700 and 1,900 acres of land. Founded between 1782 and 1784, the Sabbath Lake Shaker Village was a settlement of Shakers – a religious group that was an outgrowth of the Quaker religion who came to America to escape persecution in England. Shakers were noted for their communal living, exceptional work ethic, precise and simple craftsmanship and celibacy, which ultimately spelled the end of the faith. Sabbath Lake was added to the National Register of Historic Places in 1974. 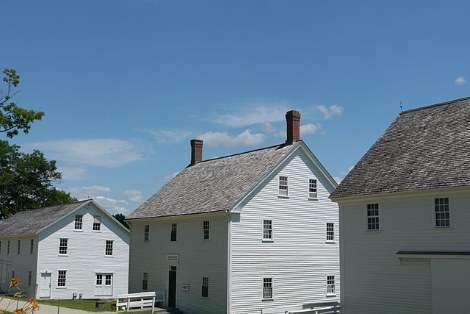 Despite the dwindling population of Shakers – the sect is no longer open to new members – Sabbath Lake remains a working Shaker Village, consisting of 18 buildings – six of which are open to the public. Summer visitors are welcome at a museum that displays Shaker crafts and tells the history of the group. 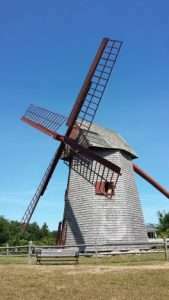 Tours of the village are offered Monday through Saturday throughout the summer. On Sunday the village is closed, though there is a weekly religious service that is open to the public. All 30,000 acres of Nantucket are in the National Historic Landmark District. 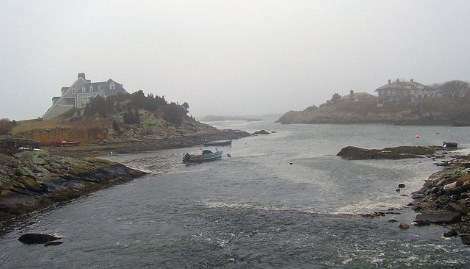 The island is considered the finest surviving example of a late 18th-century New England seaport town. America's whaling industry started on Nantucket in the late 17th century, as the original Native American whalers were imitated by the colonists. By 1774 there were 250 American ships engaged in whaling; 150 of them were from Nantucket. Whaling declined, shifting sandbars prevented ships from entering Nantucket Harbor and a fire in 1846 destroyed the commercial center. Historic preservation didn't begin on the island until 1897, when a windmill (now known as the Old Mill) built in 1746 was donated to the Nantucket Historical Association. Eight hundred structures built before the Civil War survive, including Sankaty Light, built in 1850. 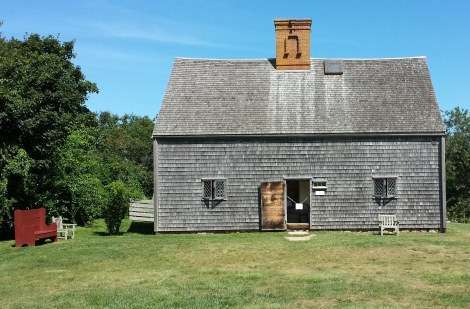 The Jethro Coffin House, the oldest on the island, was built in 1686. As Nantucket prospered, larger houses were built in the Federal and Greek Revival styles, the best examples being on Orange and Main Street. R.H. Macy ran a dry goods store on Main and Fair streets, today commemorated by a plaque. Nearby is the Pacific National Bank, where on the roof Maria Mitchell discovered a comet. 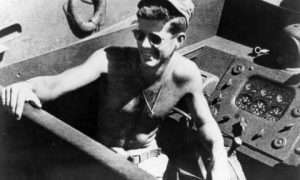 The island’s fortunes changed with the arrival of wealthy summer visitors. Some put the island on the National Trust for Historic Preservation’s most endangered list in 2000 for tearing down houses, gutting rehabs and building too-large homes on inappropriate sites. left the central village barely touched by change, and today it’s one of the prettiest places in New England. In Amherst, Horace Greeley was born, Franklin Pierce was married at his in-laws’ house and Daniel Webster argued cases in its courthouse. Today the Amherst Historic District comprises more than 1600 acres and 120 buildings in Federal, Georgian and Greek Revival styles. They’re clustered around the Village Green, where the town holds a large Fourth of July celebration, a Christmas tree lighting and band concerts throughout the summer. The Ocean Drive Historic District developed when the grand mansions on Bellevue Avenue were built, pushing development south. Ocean Drive itself is a long street that begins near Bellevue Avenue, follows the shoreline to Brenton Point State Park and ends just south of Fort Adams. The roadway winds through rolling green hills, rocky cliffs, pastures and summer houses including early 18th century farms and Eidlitz's Swiss Chalet of 1854. Frederick Law Olmsted designed some of the landscape, following the natural terrain. The homes are much more private than on Bellevue Avenue but include some architectural gems: the neoclassical Beacon Rock estate by McKim, Mead and White; French chateaux by Cram, Goodhue and Ferguson and Bonniecrest, a Tudor English mansion converted to condos. Hammersmith Farm, where Sen. John F. Kennedy married Jacqueline Bouvier, is also along Ocean Drive. Commercial buildings are generally the clubhouses of private beaches. Gooseberry Beach is private but open to the public. 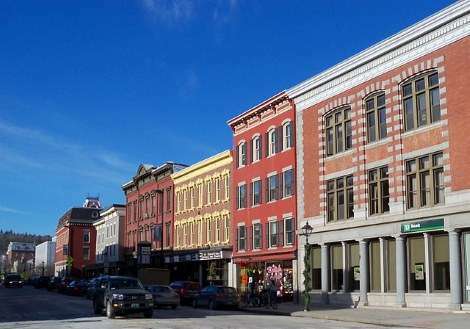 Montpelier, Vt., has the largest historic district in Vermont listed on the National Register of Historic Places. 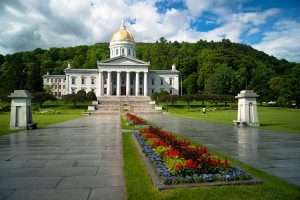 Vermont’s state capital, the city grew up around state government and the industry powered by water from the Winooski River and its North Branch. Today the historic district has 563 main properties with 90 secondary properties like bridges, dams and cemeteries. Its vibrant neighborhoods, downtown and commercial district are well preserved. 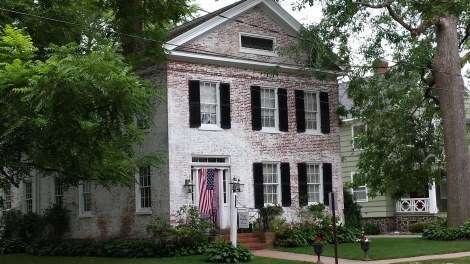 They include Federal style mansions and Greek Revival homes that survived the town’s economic boom after the Civil War. The district has five churches designed by architects between 1865 and 1874; Italianate mansions and brick commercial buildings built after two fires in 1875; elaborate French Second Empire and Queen Anne homes from the late 19th century and 20th century buildings deemed historically important. 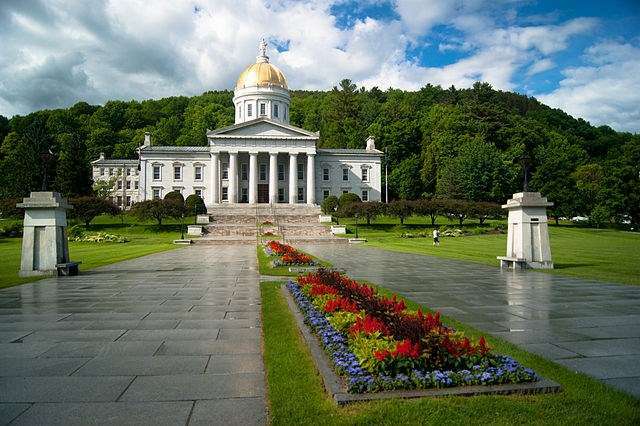 The Greek Revival Statehouse was carefully restored in the 1980s. The Vermont History Museum, next to the Statehouse, has maps of the historic district. Images: Sabbath Lake By Jamie Ribisi-Braley - Own work, CC BY-SA 3.0, https://commons.wikimedia.org/w/index.php?curid=35399926; Montpelier By AlexiusHoratius - Own work, CC BY-SA 3.0, https://commons.wikimedia.org/w/index.php?curid=23102071; Vermont Statehouse By Jonathanking - Own work, CC BY-SA 3.0, https://commons.wikimedia.org/w/index.php?curid=21731245; Amherst Civil War monument By Smuttynoser at the English language Wikipedia, CC BY-SA 3.0, https://commons.wikimedia.org/w/index.php?curid=10372554; Ocean Drive, By Daniel Case - Own work, CC BY 2.5, https://commons.wikimedia.org/w/index.php?curid=3966356. The Shaker Village is called Sabbathday Lake, not Sabbath Lake. Shakers didn’t branch off from Quakers, they branched off from Methodists. And they are definitely still open to new members.